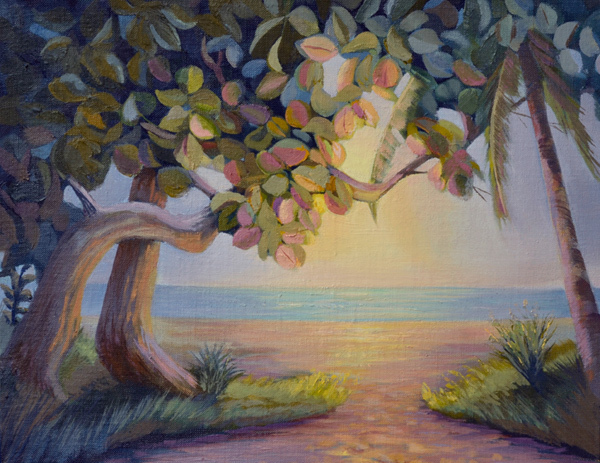 This original oil painting on linen is of a common scene along the Florida coastline, looking through the thick trees to the ocean beyond. I am standing in the shadows of the trees as I am looking for a path to the ocean. The Florida sun is creating a glow as I peer through the wide leaves. This oil painting has pretty mauve’s, greens and violets all in muted tones. This Florida landscape oil painting is available for sale and is 11″ x 14″ with your choice of a dark wood frame or a gold wood frame. Either one of those frames complement the colors in this original oil painting.